Moving right along with the printed proof of An Eternity of Four Years, the exciting conclusion to the Catahoula Series. Not making promises, but looks like it will be available as soon as three weeks from now. You have seen two previous excerpts from An Eternity of Four Years here and here. This scene takes place during the battle of Port Republic in the Shenandoah Valley in 1862. Taylor summoned me early the next morning, Sunday, 8 June, and I was given some dispatches to deliver to Jackson in Port Republic. I saddled Pepper and rode out of camp and headed for Port. The dawn was breaking clear and promised a day without rain for a change. I soon arrived at Port, crossed the North River bridge, and made my way down Main Street to Jackson’s headquarters at the Kemper Estate at the far end of town. I was not more than two squares down Main Street, when I heard the unmistakable scream of an artillery round overhead. I looked up and, to my utter shock, saw the shot falling directly towards me! There was no time to do anything but close my eyes in preparation for meeting my Maker. It crashed into the street right between Pepper’s legs and exploded with a deafening roar, knocking both Pepper and me to the ground. I rolled clear and could do little more than lay there stunned by the blast with my ears ringing. Pepper struggled to his feet screaming to wake the dead. From the sounds he was making, I was sure I would find his gut torn open, and I would be forced to end my noble steed’s agony with a shot from my Colt. My terror-stricken warhorse found his footing and bolted like a cannon shot in the direction from which we had just come. I rolled over and looked up the street to see my faithful mount deserting under fire. He slowed just long enough to decide he wanted nothing to do with that bridge and turned left and headed up the road following the North River. I whistled for him to come to me, but he did not stop and only whinnied back in answer, which if it could have been translated into English, I am sure he was saying something to the effect that I could go straight to the Devil. I figured, if he could move that fast, he couldn’t be hurt all that bad, and I turned my attention to my own wounds. To my immense relief, I found only a minor scratch on my left forearm. Except for that and ringing ears, I was unhurt. Meanwhile, I heard another round coming in and turned over onto my belly, covering my head with my arms. It exploded down the street, and I scrambled to my feet to get away from my exposed position. The second round was followed by two more, one of which slammed into the steeple of a church we were using as a hospital. As I stood, I saw Federal cavalry crossing the Upper Ford and cursed Pepper for leaving me there like he had. Our own cavalry were in retreat and scampered through town in their haste to get away from the advancing Federals and very nearly ran me over in the process. I ran up Main Street as more artillery shells careened into the town. I took cover near the church, and Jackson came riding by. Doctor McGuire was busy loading wounded into wagons and swearing at the slow moving orderlies, as was his usual manner. Stonewall reined in his mount and admonished the doctor, “Sir, don’t you think you can manage these men without swearing?” McGuire nodded and promised to try. Satisfied, Jackson spurred his mount into action and headed for the bridge at a gallop. Most of his party barely escaped capture and crossed the bridge just as Federal cavalry entered Main Street at that end of town. 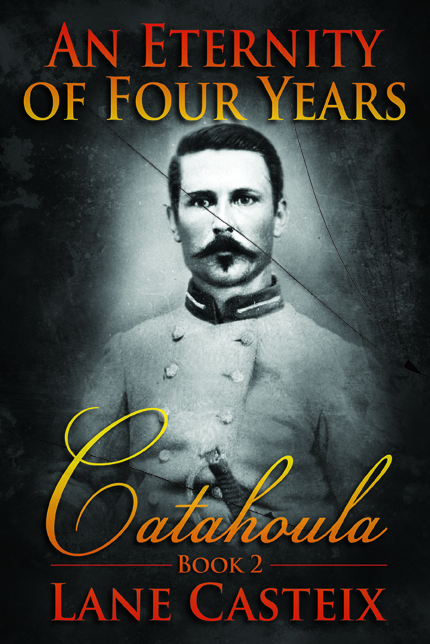 Colonel Crutchfield, Jackson’s artillery chief, was not so quick and was taken prisoner only to escape later. I drew my revolver and prepared for a fight as Union cavalry thronged the bridge end of town. Soon two cannons were brought up and unlimbered at the entrance to the covered bridge, their muzzles pointing across the river. I figured we were in a real fix then. Jackson and his army were across the river, cut off from their escape route by Union artillery and cavalry sitting on the only bridge. I knew I couldn’t storm their position alone and wasn’t doing any good staying where I was. I figured the Federals would surely go for the supply train sitting conspicuously out on the road at the other end of town and made my way toward the Kemper Estate as fast as my legs would carry me in the hope that I could find others with whom I could make a stand. In Kemper’s yard, I found Captain Sam Moore of the 2nd Virginia and his small company of only twenty muskets, which had been assigned to guard the fords. He was preparing to make a stand at the Kemper house and had already placed his company along a plank fence that surrounded it. I attached myself to this small band, and we set ourselves for the charge that was sure to come. We had not long to wait. Blue Coat cavalry came up Main Street at a walk and turned the corner headed straight for Kemper’s house and our ambush. We crouched behind the fence and allowed them to get closer. When he felt they were close enough, Moore stood and yelled, “Fire!” And twenty muskets barked. I stood and fired with them. The startled Yankees never knew what hit them, and we emptied numerous saddles. They retreated in haste back up Main Street but began regrouping for another go at us. Captain Joseph Carrington and his Charlottesville Light Artillery with a battery of two guns joined our little group. Carrington ordered both guns unlimbered moved them closer to the fence. He loaded with double canister as the Federals came up Main Street towards us. Carrington hadn’t the time to take down the boards on the fence in front of his guns. He aimed them as best he could, point blank, and moved to rip down the boards. “Leave them,” I yelled. “Just shoot through them!” He nodded and stood by his pieces, as the Yankees came at us again, at a gallop this time. With a jerk of the lanyards the two guns roared, blowing big holes in the fence boards, and we fired with pistol and musket, emptying more Yankee saddles. Once more they retired in disarray, leaving more dead and wounded on the street. Major Dabney of Jackson’s staff arrived from the Kemper house and did little but encourage us. Carrington limbered up his guns and moved them closer to the river for a shot directly down Main Street. Moore and the rest of the infantry moved to support the guns. The Yankees charged again, and once more we let them have a taste of canister and Minié. The canister swept the street and sent the survivors running for cover at the far end of town. Across the river, the 37th Virginia Regiment, under Jackson’s instructions, was preparing to assault the covered bridge, while the Rockbridge Artillery pounded the Federal positions from the far shore. Meanwhile, Taylor had been ordered to bring his brigade on the double quick. At least a regiment of Federal infantry was moving for the fords, but artillery fire personally directed by Jackson from the far side of the river forced the Federals to quit their positions at the covered bridge, abandoning their guns just as the Virginians charged. To my astonishment, the retreating Federals failed to burn the bridge. Had they done so, the events of that afternoon and the next day might have turned out very differently. We pushed them back across the fords, and our artillery pounded their retreating ranks. We had won the day. That surprise attack could have been a disaster for us had they burned that bridge and separated Jackson and his army from his supplies. The brief little fight over, I was standing near the Kemper’s house fence reloading my Colt, when I heard a familiar whinny and looked up to see my wayward steed standing there, looking for all the world to be as contrite as the most repentant sinner on a Sunday morning. “So, you came back! Skedaddled and left me to face a Yankee horde alone!” I fairly yelled at Pepper. He whinnied and shook his head as if he understood what I was saying and was making his defense. Pepper snorted forcefully, and I heard laughter coming from behind me. I turned and saw Jackson and his staff watching the show and realized what a spectacle I was making of myself by talking to a dumb horse in such a manner. Jackson’s expression was as stern as ever. “Shall I have him court marshaled, Captain?” asked Old Jack without cracking a smile. “Very well. As you wish, Captain.” Jackson nodded and rode on up to Kemper’s house, his staff following, some still laughing. To this day, I believe Jackson was serious about the court martial. I turned my attention to Pepper and examined him for wounds but found only some minor scratches on his belly and two of his legs, nothing of any consequence. “Scared you, didn’t it?” I grunted at him. “Sure did!” he replied in a high-pitched whinny. It at first startled me, but I heard snickers coming from the other side of Pepper and looked under his belly to see one of Carrington’s gunners about to split a gut laughing. Others who had been in on the joke burst out laughing then, and we all had a good belly-grabber at my expense. Lord knows we needed it.